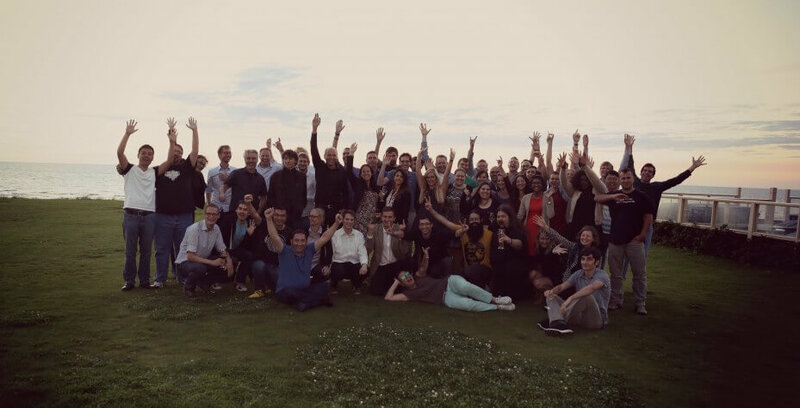 2015 was an exciting year for Textkernel, full of international growth. With customers and partners in over 24 countries worldwide, a revenue growth of more than 30% and an expanding workforce with currently 70 employees, Textkernel can look back on a very successful year. The biggest news of 2015 was without a doubt the announcement that Textkernel joined forces with the CareerBuilder Group. This strategic partnership enables Textkernel to accelerate its growth, especially in the US, and exponentially increase its R&D capabilities in order to become an even more valuable partner. This has already paid off: with a tripled revenue, Textkernel has gained a firm foothold in the US. Not only Textkernel’s business in the US market is expanding. Its presence in Europe has also rapidly grown. With new customers and partners in among others the DACH region (Germany, Austria, Switzerland), the French market and the UK, Textkernel has further established its position as leader in semantic technology. We’d like to thank all of our customers, partners and business relations for the great collaboration and trust in 2015 and look forward to a positive continuation in the next years! 2015 brought many innovations and software upgrades. For instance, Textkernel launched Hungarian CV parsing, added the options to apply with OneDrive and Monster, introduced Jobfeed in three new countries (Belgium, Austria and United Kingdom) and released version 3 of Search! 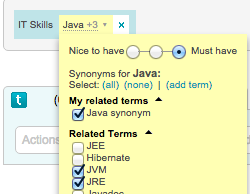 & Match with a new scalable backend and personalised semantic search. With our fast-growing technical team, customers can expect even more upgrades in 2016. The candidate experience was a big priority for many employers in 2015, as shown in Textkernel’s report: State of the Candidate Experience in 5 European countries. Textkernel anticipated to this need by making it easy for candidates to find and apply for jobs on any (mobile) device and even won the Best Online Candidate Experience Award for it. Swiss insurer Baloise and HR service provider Trenkwalder both implemented one-click apply by adding Textkernel’s ‘Apply with’ widgets to their process. They now offer their applicants a more customer-friendly application process and benefit from an increased conversion rate, also on mobile. While improving the candidate experience was a hot topic in 2015, also recruiters should not be forgotten. Textkernel paid extra attention to provide a great recruiter experience. By making it easier to find the best talent, recruiters can save time and fill jobs faster. Nuclear Research Facility CERN implemented Textkernel’s semantic technology to source in their own database and identify suitable candidates who can be considered for new positions. Textkernel held its third Innovation Week at the end of the summer. In this week-long competition, employees initiated new ideas and projects that will continue to be developed in the upcoming year. The Textkernel team was present at over 55 shows and conferences around the globe last year. At several occasions Textkernel’s employees were invited to speak as experts in their field, for example on semantic recruitment technology, candidate experience, Big Data, and talent sourcing. Also in 2016 you can find us at many events speaking, sponsoring or attending. Check out our event schedule to find out where to meet us next. Textkernel is happy to announce that the company is turning 15 next year. A university research project turned into a start-up and has grown out to become one of the international leaders in the field of semantic recruitment technology. This is something Textkernel will celebrate with our customers, partners and the industry. Stay up to date and join us for our birthday celebration. 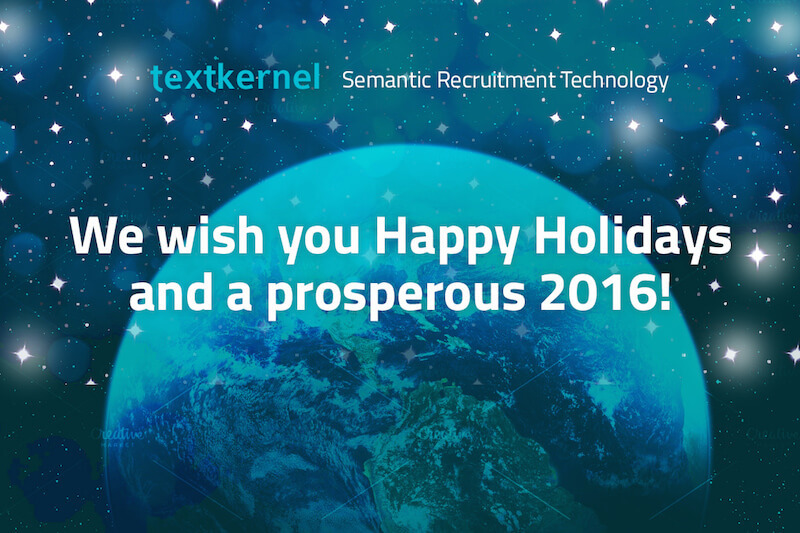 The team at Textkernel wishes everyone all the best in 2016 !